The Trapp Family Singers, shown on a US tour in 1946, inspired “The Sound of Music.” Community House of Hamilton and Wenham is staging the musical this week and next. This Saturday, the Community House of Hamilton and Wenham will welcome a special guest to its production of “The Sound of Music”: a descendant of the musical’s inspiration. 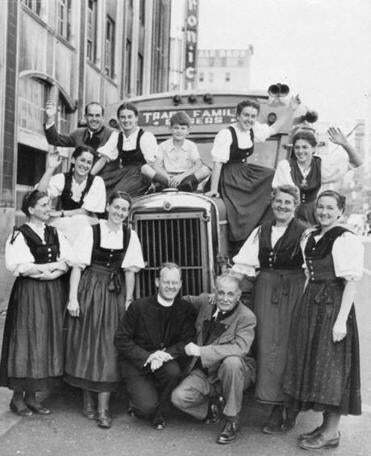 Kristina von Trapp, granddaughter of Maria and Captain Georg von Trapp, will attend the 3 p.m. performance of the community production that day and will conduct an audience question-and-answer session afterward, at 5:30 p.m. The production opens Friday at 7:30 p.m. and will continue Saturday at 3 p.m. and 7:30 p.m. and Sunday at 3 p.m. Next weekend, there are shows on Friday at 7:30 p.m., March 9 at 3 p.m. and 7:30 p.m., andMarch 10 at 3 p.m. The theater is at 284 Bay Road (Route 1A) in Hamilton. Advance tickets are $18 for adults and $13 for children and can be purchased at www.communityhouse.org or by calling 978-468-4818 ext. 10. Tickets at the door cost $20 for adults and $15 for children. For more information, visit http://communityhouse.org/theater-program/.